Ichiro Ozawa says that he's fond of working at practical things, that he "doesn't like to be showy on the stage." He had better get used to the limelight. If current polling trends continue and if  a big if  he can avoid a fatal taint from the latest of Japan's money-politics scandals, the leader of the Democratic Party of Japan (DPJ) could soon be Japan's next Prime Minister. An election for the lower house of the Diet has to be called by Sept. 10, but the surmise in Tokyo is that it may come as early as May 24, which is, by coincidence, Ozawa's 67th birthday. If the DPJ does indeed supplant the ruling Liberal Democratic Party (LDP) and form a government, the significance of its victory would be enormous. The LDP has held power continuously (save for a brief period in 1993) since the modern Japanese political system took root in 1955. And it would not just be any old opposition leader who would be taking over; it would be the man who for nearly 20 years has been a backroom maverick in Japan's political system, who detests the LDP, and who has long argued that Japan and its politics had to change if the nation was to reach its potential. Japan seems hungry to dismiss the old guard. But is Ichiro Ozawa really the outsider he appears to be? And where will he take Japan if he gets the chance to lead it? First, that scandal, which could yet derail his progress. On March 3, Ozawa's chief secretary, Takanori Okubo, was arrested by the Tokyo District Prosecutor's office on charges of taking, and falsely reporting, illegal political donations from dummy corporations linked to the company Nishimatsu Construction. 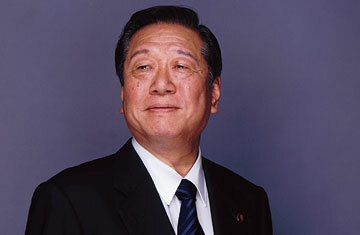 The donations are alleged to have been funneled through Ozawa's political fund. In a March 7 interview with TIME, Ozawa said that he was "very surprised" by the arrest, and that the case involved merely "errors in the statement of political fundraising records" of the sort that in the past required only a "kind of correction." The investigation has since widened to include alleged donations from Nishimatsu to LDP politicians, but the main focus so far has been on the DPJ. Ozawa says he will not step down from the party chairmanship; nonetheless, a few days after the arrest was made public, three newspaper polls found a majority of respondents thinking that he should do so. For all ozawa's support in the polls when compared with Japan's Prime Minister Taro Aso  the third lackluster holder of that office since Junichiro Koizumi resigned in 2006  the dim view taken of his alleged role in the Nishimatsu scandal illuminates the paradox of Ozawa's place in Japanese politics. He is at one and the same time the single most radical critic of the Japanese postwar political establishment (it was his decision to bolt the LDP in 1993 that led to its only period out of office) and a supreme exemplar of it. The son of a politician himself, like so many other Japanese leaders (including that other maverick, Koizumi) he entered the Diet when he was just 27. Michael Green, chairman of Japan research at the Center for Strategic and International Studies in Washington, who knew Ozawa more than 20 years ago, remembers him back then as a traditional politician "focused on bringing home the bacon" to his constituency in Iwate prefecture in northeastern Honshu. His mentors include both Kakuei Tanaka, Prime Minister from 1972 to 1974, who treated Ozawa like a son and arranged his marriage, and Shin Kanemaru, who served as Deputy Prime Minister and LDP vice president. Both were legendary political fixers, as was Ozawa before he left the party; both were eventually mired in corruption scandals. When Japan was riding high in the 1980s, commentators liked to say that it had a "first-rate economy and third-rate politics." Like it or not, for much of his career Ozawa was deeply embedded in the very political system that was the subject of such disdain. It is hardly surprising that at the first whiff of scandal, his popularity should decline.